Home > News > Sportsmanship Matters > Head Tennis Coach at Homestead High School says Sportsmanship is Very Important! Head Tennis Coach at Homestead High School says Sportsmanship is Very Important! We believe there’s something more important than just winning or losing a tournament. We believe that the team, school, and fans who support their athletes with dignity and class are the true champions. That’s why we’ve proudly sponsored the WIAA/Rural Mutual Insurance Sportsmanship Award for more than 50 years. We would like to congratulate Homestead High School on being this year’s recipient of the Girls Tennis team Sportsmanship award. 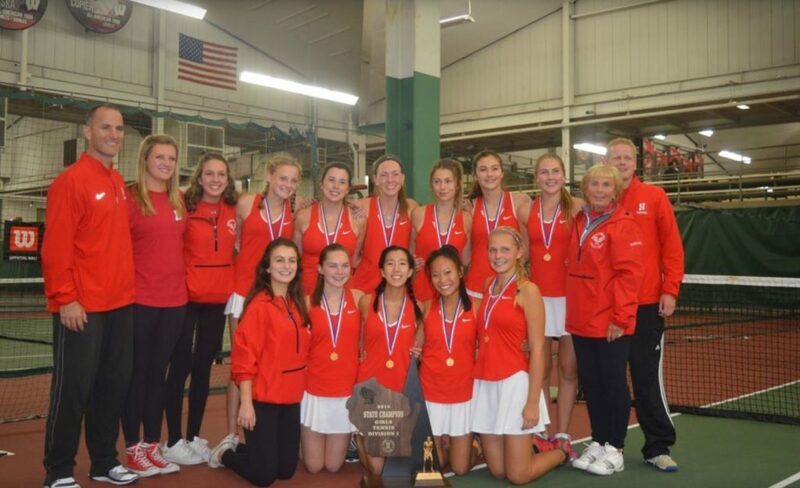 This is the second time the girl’s tennis team has won the WIAA/Rural Mutual Insurance Sportsmanship Award and the third overall award for Homestead. When talking with Head Coach, Jackie Mueller Egelhoff we asked her what this award meant to her as a coach. We are deeply honored to receive this award. This sportsmanship award is equally as exciting as winning the state championship. I grew up as a competitive player with a tennis pro father who always told us how we acted on the court was as important as winning. I am in my 40th year as a coach and always stated at the beginning of every season that sportsmanship is very important to me, it is important because they are representing their school, community their family and themselves. We will continue to stress good sportsmanship every time we compete. Congratulations again on a great season and a great achievement for the Homestead community! Rural Mutual Insurance has been a sponsor of the WIAA Sportsmanship Award since it was started in 1965. The Sportsmanship Award recognizes the entire community for their conduct and appreciation for good sportsmanship – not just the athletes and coaches – but their fans and community and how they present themselves at state tournament events. How do you win the WIAA/Rural Mutual Sportsmanship Award?